AccuWeather.comMap of polar vortex path from the north. 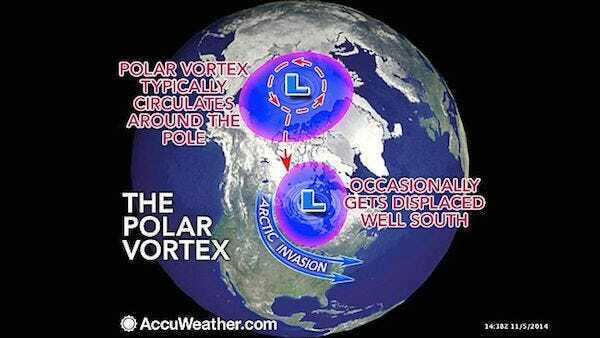 The atmosphere is preparing to send part of the polar vortex southward toward the United States next week with an outbreak of arctic air and lake-effect snow. The polar vortex is a large pocket of very cold air, typically the coldest air in the Northern Hemisphere, which sits over the polar region. Occasionally, this pocket of very cold air can get dislodged farther south than normal, leading to cold outbreaks in Canada and the U.S. 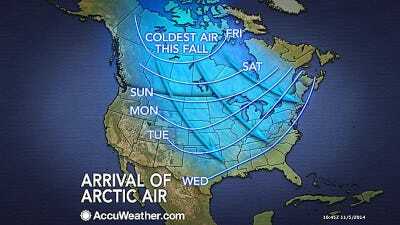 The main blast of cold air associated with the plunging polar vortex will swing southeastward into the Central and Eastern states spanning Sunday, Nov. 9, to Friday, Nov. 14, 2014. The worst of the cold will be felt from Fargo, North Dakota, and Minneapolis to Chicago, St. Louis and Cincinnati, where heating demands will jump and people will be reaching for winter coats before venturing outdoors. The cold air will be accompanied by gusty winds, which will send AccuWeather RealFeel® temperatures plunging into the single digits and teens in the north and into the 20s and 30s in part of the Deep South. Such cold will raise the risk of hypothermia and frostbite in the North and will make it uncomfortable for some outdoor activities in the South. 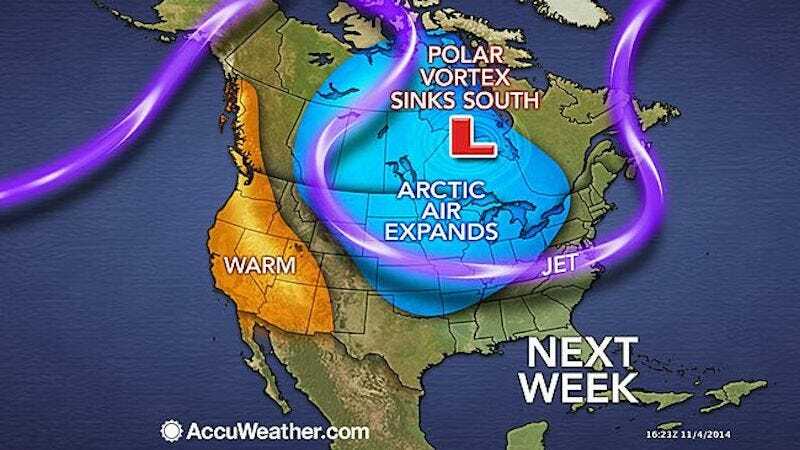 AccuWeather.comPolar vortex scheduled to hit central US next week. “It is possible single-digit low temperatures occur in parts of the northern Plains and the Upper Midwest, away from the Great Lakes with temperatures plunging to 20 degrees below average in parts of the South,” Pastelok said. 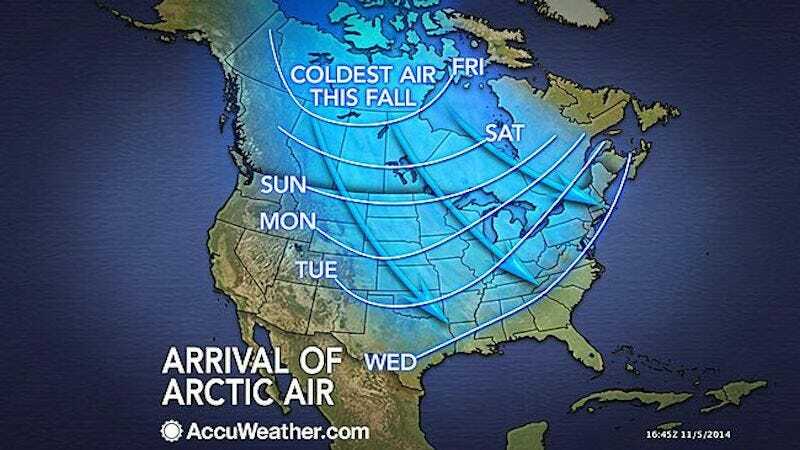 AccuWeather.comCold air from the north heads south next week. While the brunt of the cold air is not likely to be directed toward the I-95 corridor of the East, a breeze accompanying the cold air will make if feel more like December for at least a few days. The action of cold air passing over the relatively warm waters of the Great Lakes will unleash bands of lake-effect flurries, snow and squalls from the Upper Midwest to the interior Northeast. While snowfall can be heavy in a pattern such as this, it tends to be highly localised. “A broad area of snow on the ground would result in significantly lower temperatures,” Pastelok said. The bare ground and warm Great Lakes waters will take away some of the severity of this early season arctic outbreak. “Despite the moderation, freezing temperatures are possible along the upper Gulf Coast from northeast of Houston to northern Florida late next week,” Pastelok said. For folks not ready for winter, there is some indication that the cold weather will ease prior to Thanksgiving. The weather pattern forecast to send the polar vortex on a southward plunge can be traced back to the western Pacific Ocean, where Typhoon Nuri curved east of Asia earlier this week. The contorted jet stream can lead to major storms and big surges of warmth and outbreaks of cold air.